Climate, landscape, vegetation, roads, settlements...all neatly rolled up into a preliminary map. Help us develop it! ETA: First Map Sketch available! Please discuss! Even though I'm saying it for the second time (probably this is the right place now, thanks, lian!) - Let's think about our world as a system, not as islands. Let's not place one neat little thing next to the other. Let's think how they interact and how they are connected. Example: Cities that are located at rivers or at the sea are prosperous through trade. If a lord controls a road or a river, he has the power to open close it for transport and supplies. Mining for bronze and iron usually happens in mountanious regions (if you don't have the industry to dig). Even in dry regions, agriculture can make the people wealthy, if they build channels or such. I need to go to bed. Just wanted to leave you some thoughts. Do you think the Hanse concept I threw in is too over-used? I kind of like the idea myself, because it would allow for a structure that is emphatically not nation-state-like, can include quite different (govenment) styles but still provides a certain coherence. Of course, we would then have to think of the kind(s) of political systems that would allow such a loose trading federation to flourish. [ETA: … or to fail. A struggling Hanse…?] How restricive/free/rigid/controlled can such a system be? How would free cities interact with good ol'fashioned monarchies? Oligarchies (the religious ruling class mentioned)? Uh, sorry. just throwing out questions and not providing answers. But I'd love to hear if the idea strikes a chord or doesn't do anything for you before I throw myself into research etc. Now, there seem to be many hands up for the city Threshold to be located at the sea. Lian, you raised the question of what would be "out there". Being big in trading, the "out there" would be rather well known to our Thresholders, right? In COTFO, like in most worlds, we concentrate on the land, the sea is only peripheral and totally neglected. I like the idea of the 'chain' of cities along a coastline that is connected by regular trade. 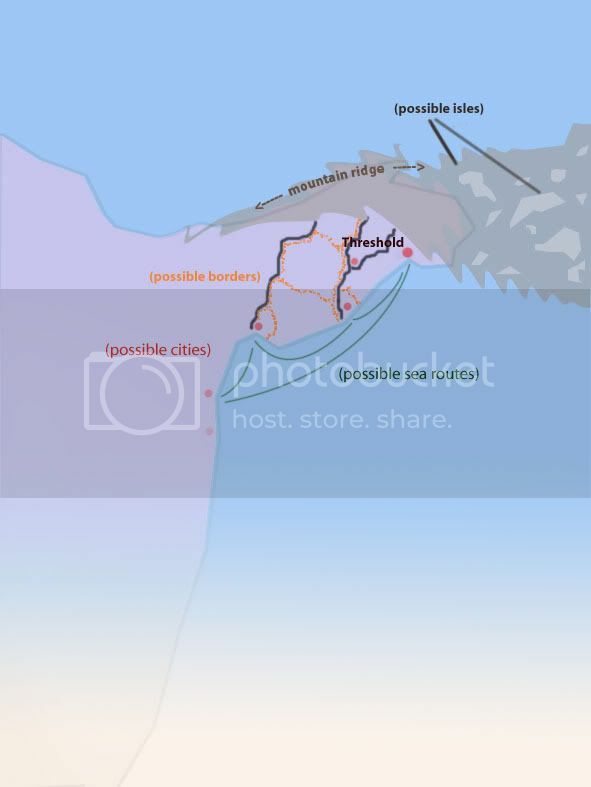 Another idea that came to my mind when you mentioned the Hanse, was ancient Greece, which was a network of islands (each island a kingdom, some small, some big), that were connected by trade, military and politics. The greece mainland was only involved in the coastal areas, I think. Also England and the Netherlands are Examples for how small states or islands can create a network accross seas. However, for ocean-crossing you need real good ships. For island-hopping, mediocre technology is alright. So - our city Threshold might be located as a port city on the mainland. Her *kingdom* (in my conception right now vassals and subkingdoms) might be both some of the many islands near the coast as well as realms on the mainland. That's why she is called 'Threshold' - it's the break from sea to land (make it a cliff by all means) but at the same time it's the link. Why do I always forget half of what I planned to say? Remember the Fugger family for example. Or many other common families (not nobles) that got wealthy with trade in medieval times in Europe (that is, 12th century). Their networks spread all across Europe, from Italy to Denmark, from Hungary to France. The monarchy didn't like it, of course. The church didn't like it. Because suddenly the common people had money and power. And there was constant fighting. But it is definitely possible. Excellent. I think it depends on the technology level we decide on — certainly deep-water oceanic travel had already been available to the Vikings, but is it available to Threshold? I wonder, but I'd lean more towards the island-hopping network idea. What would make access to these islands — that Threshold obviously has — so valubale? What do they have on offer? Are they serving as a passage way to another continent? Valuable goods/raw material? …of course, this would also threaten Threshold's privilege and power as the 'gateway' to the isalnds, becasue if everyone could now [theoretically] freely travel overseas wherever they wanted, there would be no need for the islands' passage system. - - oookay, I'll stop getting ahead of myself here and let you comment first. Ahem. I like the island idea. But be aware that there is quite a bit of seatech that needs discussed if the area and navy becomes too large. If trade is pushing technology, then that will be something to consider. Anyone want to fill Kym and I in on what the heck a "Hanse" is?